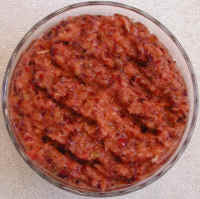 A wonderful and slightly tart relish that goes with almost any meal. Wash the fresh Cranberries and peel the Oranges. Place all the ingredients in a blender or food processor and chop into small pieces. Do not mash or puree. Taste the mixture for flavor and sweetness, and adjust to your personal taste. Be careful not to overdue either, for both sweetness and flavor improve over time. Place in a tightly closed container and store in the refrigerator. It is best to prepare the day before serving to enhance the flavor and color. The advantage to this relish is that no refined sugar is needed.